Your spunky, fun loving, show-off of a furry buddy needs some special attention. Pugs are notorious for needing special care when it comes to their diet, and when they don’t get what they need their giant personalities suffer. Make sure your tiny ball of energy gets the nutrition he needs without wrecking his very sensitive digestive system. 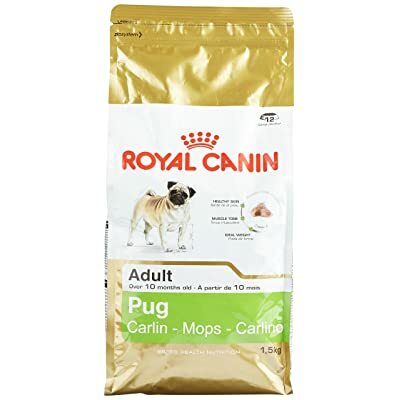 In this post, we will discuss best dog food for pugs. What all does your best friend need? Well, let’s start with their size, they’re a toy breed that needs little kibble. Because pugs, at a healthy weight, should range between 14 and 18 pounds they don’t need nearly as many calories as a medium-sized dog. But their size isn’t the only concern when it comes to their physical structure. One of the most important things to consider is their compact muzzle. The snoring and snorting which are a result of that muzzle also are key indicators that your buddy needs small kibble that’s easy to grab. Aside from their size and muzzle, there is also their coat to consider. Even though they seem like any other short-hair dog in the canine family, they have a double coat. When most people think of double-coats they imagine collies or German Shepherds. But, pugs also have a double coat which is why they shed so much! It also means that their skin and coat need some extra care. Because of the constant shedding, there’s extra demand on their skin and there is a lack of exposure to the elements. One sign of this is seeing a pug roll on the floor or stretch across the floor on their back. This is an attempt to scratch that itch under the deeper layer of fur. The final area of concern with pugs is how often they are allergy prone. Many pugs suffer from common dog allergies which include chicken, corn, soy, and wheat. Unfortunately, all of these are very common ingredients in dog foods. Of all the options out there, only a few are formulated for pugs. However, many formulas aimed at delivering peak nutrition for small dogs are great options. The goal, of course, is to find what works for you and your pug. Take into consideration the energy levels, medical needs, and weight of your pug above all else! Hand’s down the best aspect here is the ingredients list. Wellness Complete took great care in choosing the ingredients. The Turkey and Oatmeal option was the prime choice over the other Small Breed flavor options because the first ingredient is deboned a turkey. There is a bit of a secret language when it comes to reading ingredients labels on dog food. However, when you see “deboned turkey” you can know that it’s been minimally processed so far as meats for dog foods go. Afterward is chicken and salmon meal which mean that it is a hodge-podge of muscle, skin, and bone but it’s been dried to drop the moisture level. The product? A higher concentration of protein with a lower moisture content. The crude fat holding at 16% is a bit high for pugs. This is because they generally have a lower energy level than most other small dogs, like Yorkies. High-fat formulas are one reason why we see so many overweight pugs. If your pug is friendly but a little chubby, a high crude fat content can further contribute to weight gain. This is a difficult area for many pug owners. Pugs appear as very high energy, however in comparison to many small breeds they don’t perform on their levels. This is a great option for healthy-weight pugs. You can also take this as an option to consider for puppies that are still growing and very high energy. Additionally, if your pug is very active they can probably handle the high-fat content without any cause for concern. The protein is at a great level for small dogs and the kibble is of a size that encourages chewing. The chewing problem is well-known among pug owners. Making them stop to chew can help dental health, but also help their snorting while they eat. Royal Canin put a focus on pug’s skin needs. The kibble is designed for their short muzzle and takes into account their breathing problems. Pugs often rely on inhaling their kibble to pick it up and as a result, they don’t chew a lot. This further aggravates their breathing problems making each following bite more difficult. However, with these small kibbles that are shaped like triangles but have indents on each side. Not only does this size make it easy for pugs to pick up, but to chew also. The dental issues pugs have, AKA bad breath, are well known. Getting them to chew won’t guarantee fresh breath, but, it will ensure that they’re getting some friction against their teeth breaking up any bacterial build up. It’s the doggy method of brushing! The formula is made up of chicken meal, oatmeal, corn, rice and brown rice. In short, it has two of the most common dog allergies. Although the formula is high omega fatty acids which aid a pug’s skin and coat, the allergies here will irritate their skin more. Not to mention many dogs to experience allergies to chicken and corn are gassy and bloated. Overall, this formula is a great option if you know without a doubt that your pug is allergy free. Otherwise, you may aggravate issues you’re trying to help. The kibble is great and really one of the best reasons to choose this brand. If you see your pug suffering while eating, switching to Royal Canin for Pugs could help them learn to chew better. 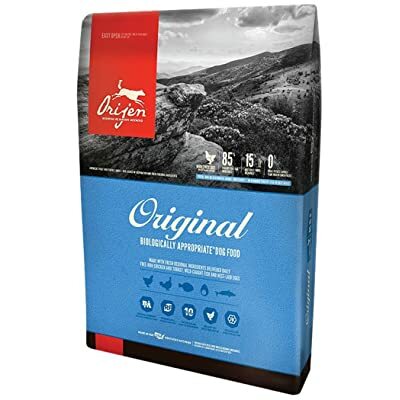 Orijen delivers exactly where Royal Canin faltered, allergen consideration. A grain-free ingredients list that highlights, fish, and turkey its only common allergen is chicken. Your furry pal’s skin issues and digestive concerns can be affected by many common allergies. Therefore, many dogs, not just pugs, suffer from itchy skin and patchy spots in their fur. Others lick their paws to ease itching and some experience bad gas or deadly bloating. Through elimination, many of these side effects can be avoided. It isn’t a sure-fire option to fix a problem and you should still consult with your veterinarian. Overall, the price is what many people will probably consider first with Orijen. Although many loving pet owners can budget for expensive diet changes if it means a healthier or happier life for their pug, Orijen is a little too pricey for most pet owners. If you can afford Orijen it is a formula that isn’t beaten easily. 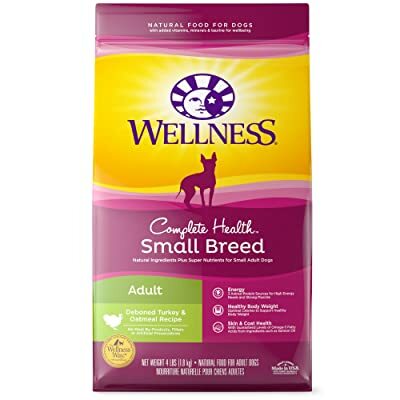 A stable option to support a pug’s health with small kibble for easy pickup. The protein is high-quality, and the fat is at healthy levels. AvoDerm outdoes themselves with two key ingredients. First, beef and secondly, avocados. Both are full of healthy fats, but each has its own special impact. The beef aids digestion by delivering a protein that your pug won’t be allergic to unless your pug has extremely rare allergies. There isn’t very much to dislike about AvoDerm. As with other options listed here, it’s fat content is high if your pug is already overweight. 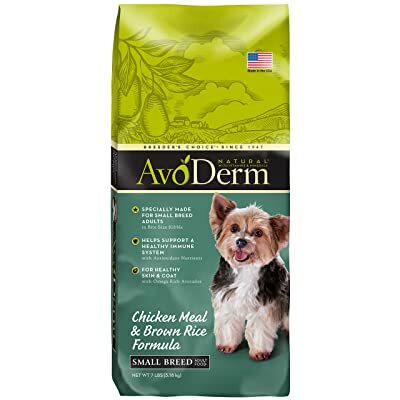 Overall AvoDerm is a great, premium dog food brand. It delivers in nearly every aspect of a great dog food for pugs. The formula is made up of chicken meal, so the protein is highly concentrated, and the moisture content is low. What this means for you is that the protein is more meaningful than other formulas. However, keep in mind this is further processing. The primary ingredient is again, chicken. But, if you know your pug doesn’t have allergies this is a great option. Many aspects of this formula do very well for pugs, but this is the one feature that won’t work for every dog. As always, consider your dogs needs first. You should know if your dog has allergies to chicken-based formulas. Look for signs like rolling, paw chewing or licking and of course gassiness or bloating. If your pug is showing these signs, speak with your vet to determine if the allergy is chicken or many something else. But, if your pug isn’t allergy-prone to chicken this is a great weight management formula that doesn’t leave your pug with severely dropped energy. 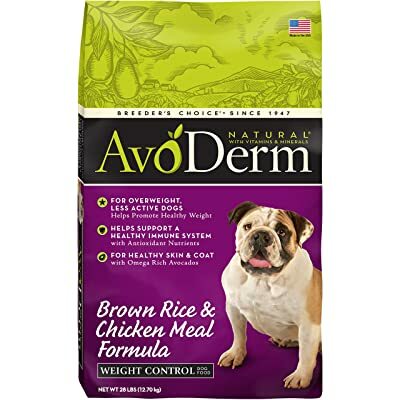 AvoDerm for small breeds provides nearly every feature we could look for in the best dog food for pug’s search! The formula starts out by avoiding any of the common dog allergens including chicken. It’s also part of a diet that is meant to be easily rotated within their formula. The entire line is based on a rotational diet to keep small dog digestion issues at bay. Aside from beef, are lamb and salmon options. Part of each option is avocado, which provides healthy fats and lots of omega-3 and omega-6 fatty acids. These omegas are part of maintaining proper skin and coat health. But, each variety is available in a kibble that’s small and easy for them to grab.